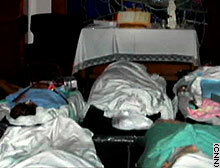 Bodies lie wrapped at Memorial Medical Center in the aftermath of Hurricane Katrina. NEW ORLEANS, Louisiana (CNN) -- A doctor and two nurses were charged with second-degree murder Tuesday after Louisiana's attorney general launched an extensive investigation to uncover whether hospital staff euthanized some patients after Hurricane Katrina hit, a source close to the case told CNN. Late Monday, Dr. Anna Pou, Lori L. Budo and Cheri Landry were arrested in connection with the alleged deliberate deaths of some patients at New Orleans Memorial Medical Center after Hurricane Katrina hit, a source close to the investigation told CNN. The three were booked and released around midnight, jail officials said. Further details of the arrests and investigation into the alleged deliberate deaths at New Orleans Memorial Medical Center are expected to be disclosed by Louisiana's attorney general Charles Foti, Jr. at a news conference Tuesday afternoon. Foti has been investigating for months whether hospital and medical staff euthanized some patients. He is expected to outline what he thinks happened to some of the 45 Memorial Hospital patients who were found dead after the August hurricane evacuations. "We obviously think it's a very credible ... we spent a lot of time, energy and manpower working on this case ... so we think it's a good case," Foti told CNN in February. In October, CNN reported exclusively that after deteriorating conditions -- with food running low and no electricity -- some medical staff openly discussed whether patients should be euthanized. Dr. Bryant King, a contract physician for Memorial who was working before and after the hurricane, said another doctor came to him and recounted a conversation the doctor claimed she had earlier with a hospital administrator. According to King, the doctor said that the administrator suggested patients be put "out of their misery." King said when he objected this physician acknowledged his concerns but said that "this other (third) doctor said she'd be willing to do it." King told CNN that he later that day saw one doctor holding a handful of syringes. He left, King said, because he believed the doctors would follow through with their suggestion of euthanasia. However, King never saw any wrongdoing occur. Shortly after he began his investigation last year, Foti issued 73 subpoenas to hospital staff and physicians after he said the hospital owner, Tenet, was not cooperating in the investigation. Since then tissue samples have been sent to a private East Coast lab to determine if fatal doses of medicine -- including the painkiller morphine -- were in the bodies of any of the dead, New Orleans Parish Coroner Frank Minyard told CNN in December. From CNN's Drew Griffin and Kathleen Johnston.